Some people are content with the typical toast and butter. I am definitely not one of those people. Adding an assortment of your favorite ingredients can transform an ordinary piece of toast into a gourmet dish. Mexitoast is something I concocted while studying for and taking midterms during my sophomore year. When I was growing up, my mom always made omelets for breakfast on days when I had tests. She taught me about the importance of breakfast: that feeding your brain in the morning will help you function throughout the day. In college, many students lose good eating habits by forgoing breakfast. People have told me they don’t have enough time for a good meal in the morning; making eggs takes prepping, cooking and cleaning time. I came up with a substitute breakfast that’s scrumptious and full of nutrients. Mexitoast is fast and easy and can be taken on the go! It was originally intended for breakfast,, but it works for any meal! Cut the avocado into fairly thick pieces. Cut your tomato and mango into small pieces. 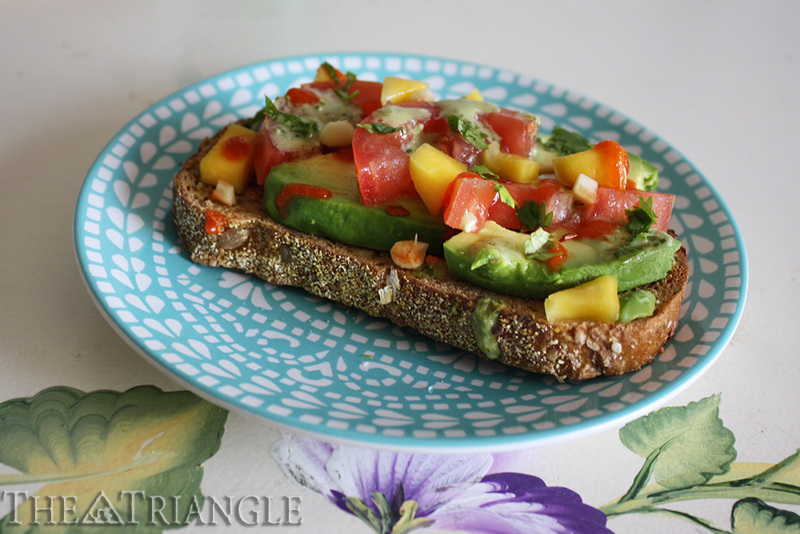 Lay the avocado on the toasted bread. Spread the tomato and mango on top. Sprinkle on the cilantro dressing. Add Sriracha and red pepper flakes. Dash a little bit of salt, squeeze fresh lime and spread chopped cilantro on top.